SUMMARY: The purpose of this article was to review the embryologic stages of the cerebral cortex, illustrate the classification of disorders of cortical formation, and finally describe the main MR imaging features of these disorders. Disorders of cortical formation are classified according to the embryologic stage of the cerebral cortex at which the abnormality occurred. 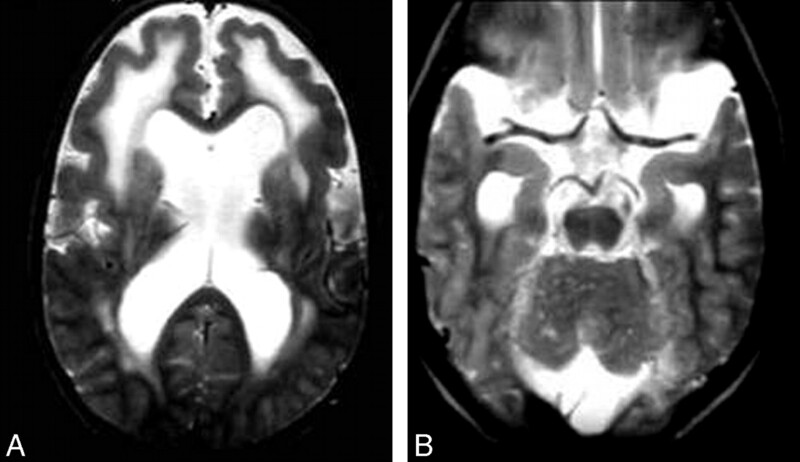 MR imaging shows diminished cortical thickness and sulcation in microcephaly, enlarged dysplastic cortex in hemimegalencephaly, and ipsilateral focal cortical thickening with radial hyperintense bands in focal cortical dysplasia. MR imaging detects smooth brain in classic lissencephaly, the nodular cortex with cobblestone cortex with congenital muscular dystrophy, and the ectopic position of the gray matter with heterotopias. MR imaging can detect polymicrogyria and related syndromes as well as the types of schizencephaly. We concluded that MR imaging is essential to demonstrate the morphology, distribution, and extent of different disorders of cortical formation as well as the associated anomalies and related syndromes. The purpose of this article was to review the embryologic stages of the cerebral cortex, illustrate the classification of the disorders of cortical formation, and finally describe the main MR imaging features of these disorders. The classification scheme of disorders of cortical formations evolves every few years on the basis of neurogenetic insight into the various syndromes. Barkovich et al in 19967 proposed a classification scheme for disorders of cortical formation, based on the first step at which the developmental process was disturbed. This classification was updated by Barkovich et al in 2001.10 Last, Barkovich et al in 20059 described the disorders of cortical malformations by the causative gene rather than by the clinical phenotype wherever possible. The Table shows a simplified form of the classification of disorders of cortical formation. These 3 major stages of cortical development are not temporally separate: Proliferation continues after migration begins and migration continues as organization commences. The cell resulting from abnormal proliferation often does not migrate or organized properly. Disorders of cortical formation resulting from abnormal cell proliferation might result from too many or too few neurons or abnormal cells. Microlissencephaly results from too few neurons, hemimegalencephaly results from too many cells, and focal cortical dysplasia (FCD) results from abnormal cells. Disorders of neuronal migration include malformations such as classic lissencephaly, which results from arrest of neuronal migration; cobblestone lissencephaly, which develops from overmigration of the neurons; and heterotopia, which occurs as a result of ectopic neuronal migration. Disorders of cortical organization result from prenatal ischemia or infection. Polymicrogyria (PMG) results from injury of the superficial part of the brain, whereas schizencephaly is due to insult of the whole thickness of the brain. Microlissencephaly/microcephaly with a simplified gyral pattern is characterized by profound microcephaly and abnormal sulcation. The patient presents with profound congenital microcephaly (head circumference <3 SD below normal for that age) without in utero injury. This disorder results from either decreased cell production or increased apoptosis (programmed cell death) in the germinal zone of the cerebral cortex. It is classified into microlissencephaly (severe form) and microcephaly with a simplified gyral pattern (mild form). Microlissencephaly. 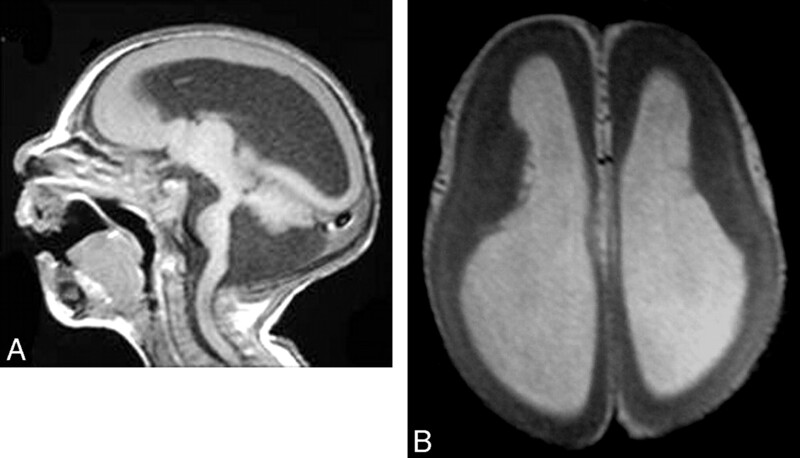 A, Sagittal T1-weighted image shows no sulcation in the cerebrum, a hypoplastic cerebellum, and a small brain stem with Dandy-Walker syndrome. B, Axial T1-weighted image shows agyria of the cortex. Hemimegalencephaly is characterized by enlarged and dysplastic hamartomatous overgrowth of part or all of the cerebral hemisphere. It results from too many neuromas or decreased apoptosis. 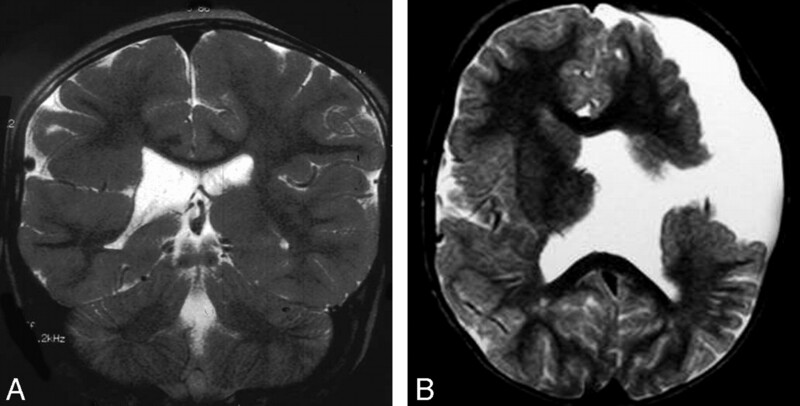 It may be an isolated anomaly; a total hemimegalencephaly with enlargement of the ipsilateral cerebellum and brain stem; or associated with syndromes such as epidermal nevus syndrome, proteus syndrome, unilateral hypomelanosis of Ito, neurofibromatosis type I, Klippel-Trenaunay syndrome, and tuberous sclerosis. Hemimegalencephaly. A and B, Coronal T2-weighted images show an enlarged left cerebral hemisphere, a dilated left lateral ventricle, and a thickened cerebral cortex. Courtesy of Dr R. Zimmerman, Philadelphia. FCD is a heterogeneous group of lesions characterized by the presence of abnormal neurons and glial cells within a localized region of the cerebral cortex. Patients usually present with intractable seizures. FCD encompasses a spectrum of malformations ranging from mild forms of cortical disruption without cellular abnormality to severe forms with marked cortical dyslamination, large bizarre cells, and astrocytosis of the cerebral cortex. Taylor FCD is characterized by cytoarchitectural disarray of the cortex caused by large bizarre disoriented neurons together with the presence of balloon cells in the subcortical white matter and the cortex. The cortical neurons are increased in number and abnormally distributed. Balloon cells possess the characteristics of both neurons and astrocytes. Focal cortical dysplasia. 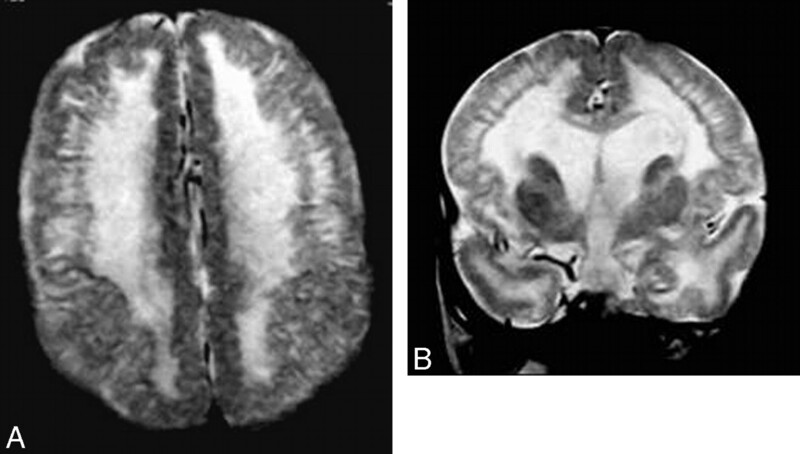 A and B, Axial and coronal T2-weighted images show focal cortical thickening in the right frontal lobe. Courtesy of Dr R. Zimmerman, Philadelphia. Patients with classic lissencephaly may have a smooth brain surface in the complete form, or more commonly, they have a smooth surface with some gyral formation along the inferior frontal and temporal lobes in the incomplete form. This anomaly results from arrest of the migration process. Patients present with seizures and developmental delay in the complete form or complex seizures, hypotonia, microcephaly (50%), and facial dysmorphism (30%) in the incomplete form. The malformation is characterized by complete agyria in the complete form or parieto-occipital agyria with frontotemporal pachygyria in the incomplete form. The cortex is thick because it encompasses radial columns of the arrested cells. The subcortical white matter is thin, with a lack of the normal gray-white matter interdigitation. There is a circumferential band of high signal intensity on T2-weighted images, most prominent in the parieto-occipital cortex, corresponding to a sparse cell zone with increased water content. Cerebral configuration is oval or hourglass with shallow Sylvian fissures due to lack of or incomplete operculization (Fig 4). Complete lissencephaly. Axial T2-weighted image shows complete absence of sulci with a thick cortex, a shallow Sylvian fissure, and a circumferential band of high signal intensity in the parietooccipital cortex. Cobblestone lissencephaly. A and B, Axial and coronal T2-weighted images show an irregular nodular cortex with hypomyelination of the white matter. WWS. A, Axial T2-weighted image shows a cobblestone cerebral cortex with hypomyelination of the white matter. 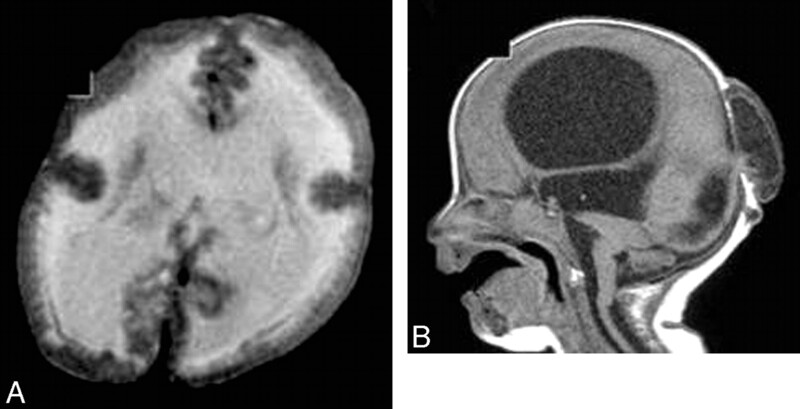 B, Sagittal T1-weighted image shows hydrocephalus, an occipital encephalocele, a pontomedullary kink, and a small pons. MEB syndrome. 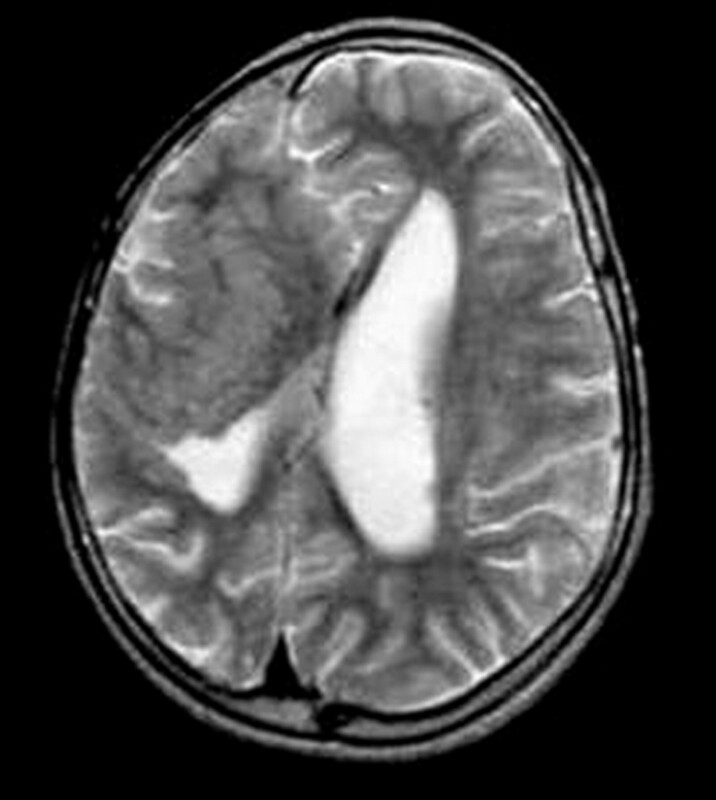 A, Axial T2-weighted image shows undersulcation of the frontal lobe, hypomyelination of the frontal white matter, and dilated lateral ventricles. 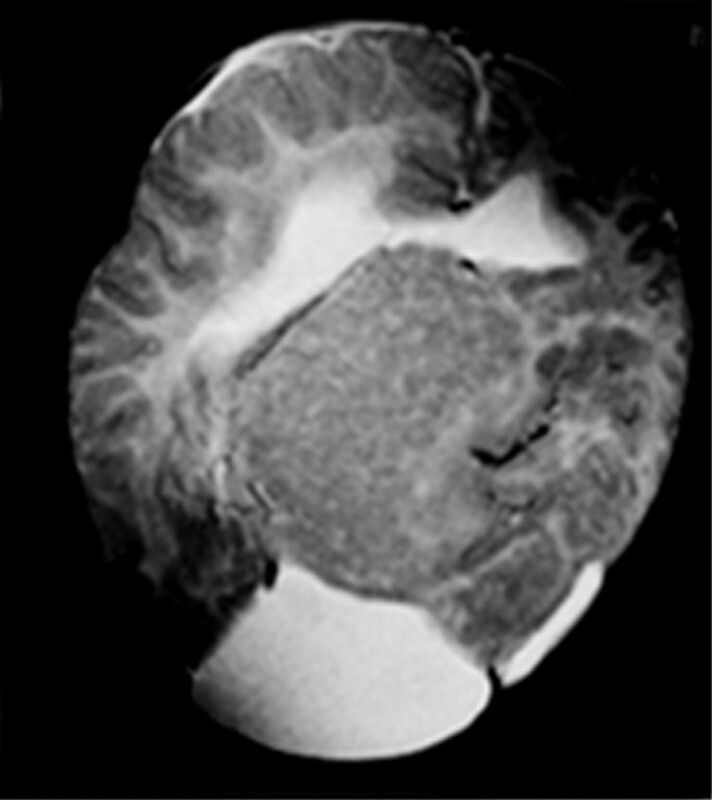 B, Axial T2-weighted image shows multiple small cerebellar cysts, with a small pons and bilateral temporal arachnoid cysts. PVH. A and B, Coronal T1-weighted images show a few small periventricular nodules, isointense to the gray matter, along the lateral ventricular wall. Subcortical heterotopias (SCH) are located within the subcortical or deep white matter and are always seen contiguous to the overlying cortex or the underlying ventricular system. The affected hemisphere may decrease in size as a result of the decreased volume of the neurons. The overlying cortex appears thin with shallow sulci. SCH are either nodular, curvilinear, or mixed form. Nodular SCH appear as nodules that extend from the ventricular surface outward into the white matter without continuity with the cerebral cortex. They are variable in size from small lesions of less than a centimeter to large lesions of several centimeters that may occupy almost 1 cerebral hemisphere. Nodular SCH appear as a large mass lesion on 1 side of the brain. Curvilinear SCH consist of swirling heterogeneous curvilinear masses of gray matter that have an appearance that closely resembles convolutions of the cortex, extending from the cortical surface into the white matter. They may contain blood vessels and CSF. The blood vessels course within the layer of the gray matter, and the CSF is seen between the gray matter convolutions. When both occur, the vessels seem to course within the fluid. The blood vessels and fluid seen within heterotopia are due to abnormal communication with the subarachnoid space (Fig 9). Curvilinear SCH. Axial T2-weighted MR image shows curvilinear heterotopias in the right cerebral hemisphere that are associated with its decrease in size. Mixed SCH. Axial T2-weighted MR image shows a large nodule adjacent to the lateral ventricle with a signal intensity similar to that of the gray matter and curvilinear convolutions in the superficial part. PMG is characterized by small fine undulating gyri, very similar to an undulating cortical ribbon, which cannot be detected on imaging. The cortex is also slightly thickened (5–7 mm) with an abnormal increased T2 signal intensity of the underlying white matter, which is noted in 25% of cases.2,41 When PMG is due to congenital infection, the areas of T2 prolongation are present bilaterally in the cerebral white matter. An anomalous vein is commonly seen in the region of PMG. PMG. 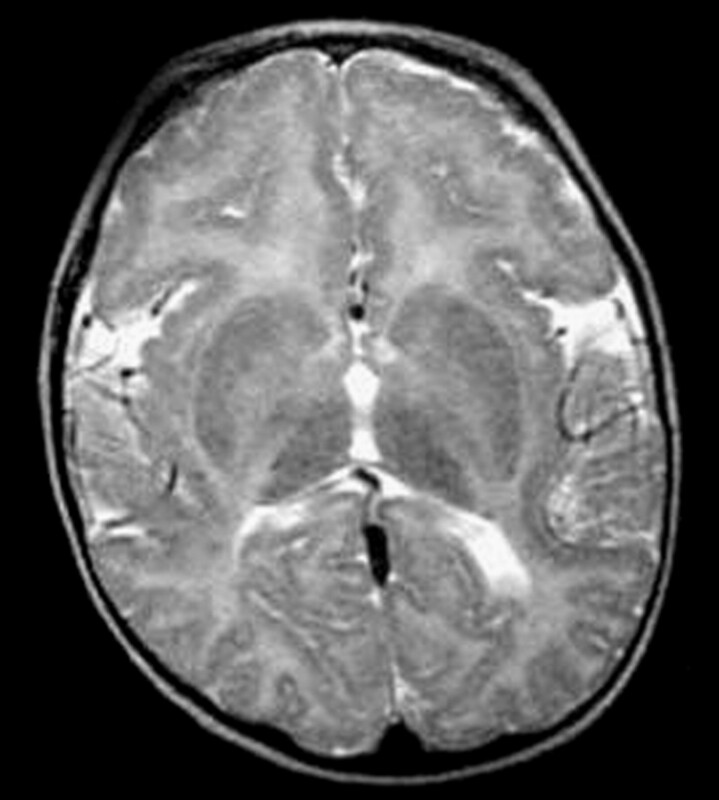 Axial T2-weighted image shows microgyria with normal cortical thickness that is associated with the high signal intensity of the white matter. Schizencephaly is a cleft lined with gray matter and connecting the subarachnoid CSF spaces with the ventricular system. Schizencephaly results from injury involving the entire thickness of the developing hemisphere during cortical organization. The injuries are due to prenatal infection, ischemia, or chromosomal abnormalities. Clinical manifestations of schizencephaly most often include varying degrees of developmental delay, motor impairment, and seizures. It might be associated with septo-optic dysplasia, optic nerve hypoplasia or the absence of septum pellucidum, pachygyria, PMG, heterotopia, and arachnoid cysts. Schizencephaly. 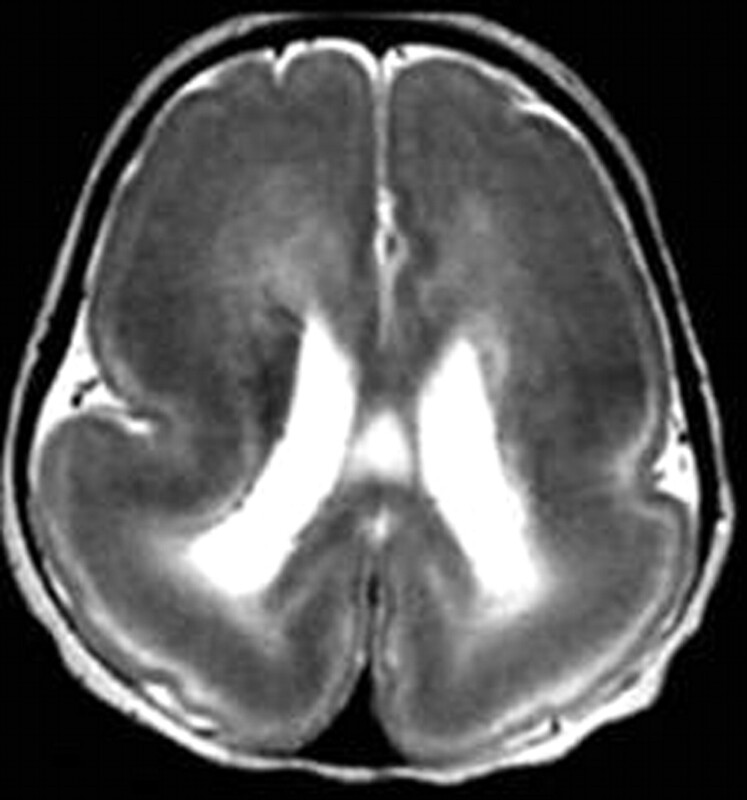 A, Coronal T2-weighted image shows a closed-lip right-sided schizencephalic defect lined by pachygyria. (Courtesy of Dr R. Zimmerman, Philadelphia.) B, Coronal T2-weighted image shows a wide CSF-filled cleft connecting the left lateral ventricle with the subarachnoid space, which is lined with gray matter parenchyma. MR imaging is an important tool for the diagnosis of disorders of cortical formation. It is essential to demonstrate the morphology, distribution, and extent of these disorders. Moreover, it can identify the associated congenital anomalies and related syndromes and suggest the genetic abnormalities. We thank Robert Zimmerman, MD, Professor of Radiology at Children's Hospital of Philadelphia, for his help with some figures of this article. Paper previously presented at: Annual Meeting of the Radiological Society of North America, November 26–December 1, 2006; Chicago, Ill. Accepted after revision May 26, 2008.